When you start to reflect on the past year it is very easy to focus on the negatives. Human nature has us thinking about all the things that failed, went wrong, that became the low points. When I started to write this article, even though I am a coach and mentor, I did the same. I started the way I always done and let my emotions lead the way. As someone who has a naturally positive nature, often accused of always seeing the best in people and situations, I had been feeling emotionally low for a few months; and yes this had an impact on how I viewed the past year. Thinking about what to write for this last issue this year of Invenio, and reflecting over the past year, it came to me that I could intuitively follow a new process. Enlightening! Let me share it with you. 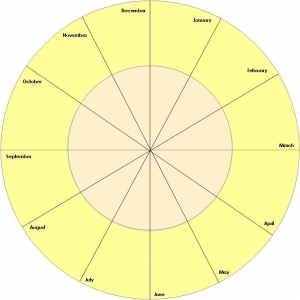 Create a 12 segment Wheel (dodecagon) which I have called the Wheel of Annual Review. Normally the spoke the wheel represents the levels of satisfaction from 0 (in the centre) to 10 (at the outer ring). Today you will split each spoke into two main representations of levels of satisfaction – low situated towards the middle of the ring, and high situated towards the outer band of the circle. 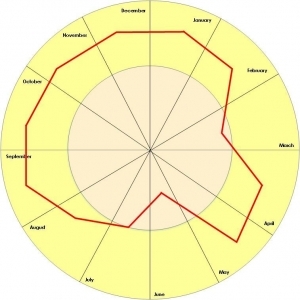 Name each segment as a month of the year: January through December. Clear your mind of all your current thoughts – work, spouse/partner, children, friends, customers, or anything else. Turn off your mobile! Be in a place where you will not get any disturbances. It is important that you have no interruptions while you do this exercise. Starting with January write one word in the segment to represent each high point, success, achievement, goal reached, low point, perceived failure, etc. 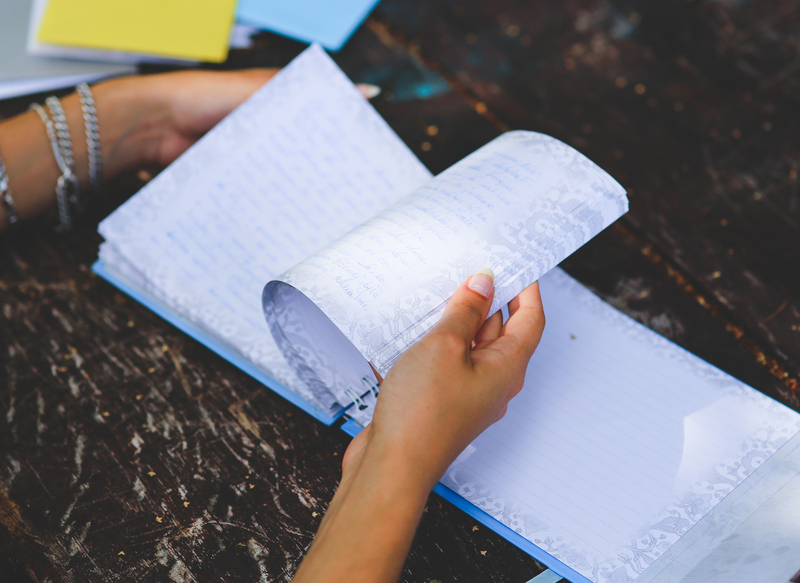 It is important that you write the word in the correct area of the segment from your first intuitive thought, rather than through logical processing in your mind of each activity, event, or task. Write the highs closer to the outer rim, and the lows towards the centre of the ring. Although there is no restriction other than space to the number of words that you enter into your segment, think about how you want to represent each element of each month that you are entering. Naturally month may have highs and lows. It is important to enter each representative word in the right area of the segment, ensuring that you get a true feel for how you are reflecting on the month. It is important that when you are doing step 5 that you follow your first feeling or intuition. Do not analyse your information. During this month, what has made me happy? During this month, what has made me sad? During this month. What successes did I have? During this month, what has challenged me? During this month, who has congratulated me? What was the reason? During this month, who has argued with me? What was the reason? If I was someone else, looking at my day to day successes, what would I see? If I was someone else, looking at my day to day challenges, what would I see? During this month, what went really well? During this month, what challenged me? During this month, what could I have done better? During this month, what could I have done differently? … and many more thought provoking questions. It is important to look back to your New Year’s Resolutions or goals that you set at the beginning of the year, and include them too. 7. Take each month one at a time and fill in your words to represent your month. If you feel that you need to go back into previous months or into a future month, enter the word. 8. Once you have completed each month, take a quick look as sometimes we miss that one big thing that happened. More often than not, it was something hugely positive. 9. Once you have completed each month, taking a different coloured pen, rate each month. Rating your month means putting a mark in the segment which is stronger i.e. more success in a month gives you a rating of a high month. 10. After rating each month of your year to truly understand your own balance, you need to join up these marks. This will give you your own outer rim for your own Wheel of Annual Review. Before we progress, it is important to realise that you will have low periods during the year. What you are looking for here is to see how balanced your year is towards the positive. Does your line look something like this one? Equating your wheel of annual review to a wheel on your car, what would it be like if you started to drive your car? Maybe not as dangerous as if you were doing you Wheel of Life and rating each segment of your life, but the aim here is to understand the low points of the year and hopefully become more aware of what you can do to change next year, so that the overall year becomes more positive. When I look at my year, I wonder how life looks so positive: but it was brought home to me when a friend was really delighted about an award I won! With everything else that had been going on although I knew I had won a business coaching award, I had not recognised or acknowledged my success. It is human nature to focus on the not so positives. By focusing on the not so positives, you bring down your own energy levels. Now as you are coming towards the end of thecalendar year and to a time where you consider your plans and goals for next year; stop and take a look at this year. What have you got to celebrate? What should you have celebrated but missed? What passed you by? This is an important question because sometimes you are so involved in what is happening now, that you don’t stop to appreciate what has happened. What do you feel could have gone better? … and your reason for thinking this? When you go back to what you wanted to happen this year, the goals you set, and review where you are today; what didn’t happen, or happen the way you wanted it to? Reflection is not right, nor is it wrong. It is more about ‘being aware’. Being aware of what you want in your life, what you have got, and what you have not got. Being aware of what is happening every day of your life helps you gain what you want from you life, and experience a lot more positive days than those are not so positive. To learn more about using the Wheel of Life or adapting it for yourself or your clients, please contact me.